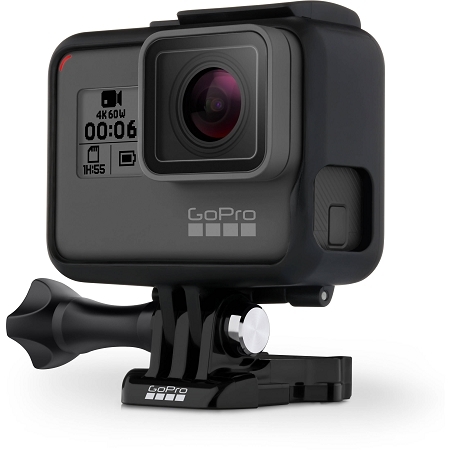 Built on the existing form-factor of the HERO5 Black, the GoPro HERO6 Blackaction camera provides more processing power than the preceding model, while keeping to a familiar design. The optimized GP1 processor brings higher frame rates in 4K, 2.7K, and 1080p HD resolutions. Where previous models maxed out at 30 fps in 4K, the HERO6 Black can muster 60 fps for rendering smooth motion or even slow motion in timelines with slower frame rates. Other processor-intensive tasks, such as image stabilization, have also been improved in the HERO6. Use your HERO6 without additional housing at depth up to 33ft.